Before considering each energy source in detail it is useful to compare their contributions to world energy consumption. This serves to keep their relative importance in perspective. Figures 1.3 and 1.4 and Table 1.1 provide some figures for past consumption and estimates for the future. The four main producers are coal, oil, natural gas and nuclear, with smaller contributions from other sources. Hydro is the next in importance but as it is limited by the number of suitable rivers its contribution remains almost constant and its relative contribution decreases. The contribution of the remaining sources is rather small. The 'traditional' renewable energy sources such as wood, straw and dung (biomass) amounted to 0.9 GTOE in 1990. Modern biomass is growing special crops such as willow for subsequent burning. Figure 1.3. 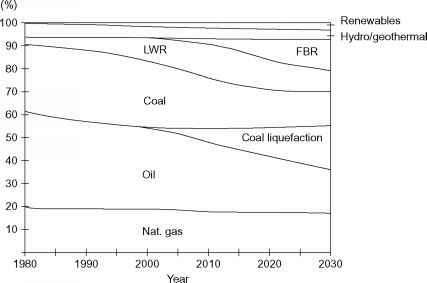 Energy Consumption Outlook in the Western World (GtOE) (World Energy Needs and Resources). Figure 1.4. Shares of primary energy sources in the global energy balance (World Energy Needs Resources). 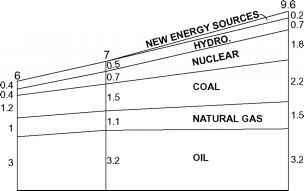 Sources: For 1860, 1900 and 1950: Nuclear Energy in Industry (Crowther 1957); figures converted from coal equivalent to oil-equivalent energy by dividing by 1.5. For 2000: Statistical Review of World Energy (1999 BP Amoco), trended up to 2000; except wood etc., from Rural Energy and Development (1996 World Bank). For primary energy, BP assumes that one tonne of oil produces 4000 kWh in a modern power station. by 2020 (Nuclear Issues, June 2005). An additional 2 million cars were sold in 2003, an increase of 80% over 2002. These uncertainties are characteristic of all estimates of future energy production and demand. 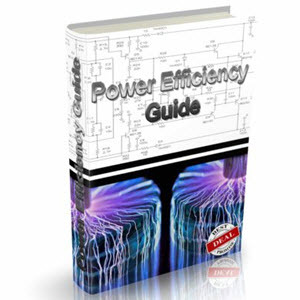 Some variability is to be expected due to different availabilities and costs of raw materials, different legal requirements concerning the siting, building and running of power stations and in addition large variations may occur due to political pressures and unexpected events. It is also not unknown for figures to be carefully selected according to different criteria in order to produce a result that is already desired on political grounds. It is therefore important to collect statistics from various sources whenever possible and analyse them in detail before reaching a final estimate. The rates of energy consumption vary from one country to another, depending on the wealth of the country, its Government and its natural resources. The energy use in Britain, Switzerland, India and the USA is given by Ramage (1997). It is instructive to compare these figures with those for the sources of electricity in France, one of the countries with the highest nuclear component. In 2006 the production was 549 TWh, consisting of 429 (78%) nuclear; 61 (11%) hydro; 57 thermal (10%) and 2.2 Wind (0.4%) (Nuclear Issues 30, March 2008).